Sublimated tiles can be a great way to preserve a precious memory and a great product to sell to your customers. 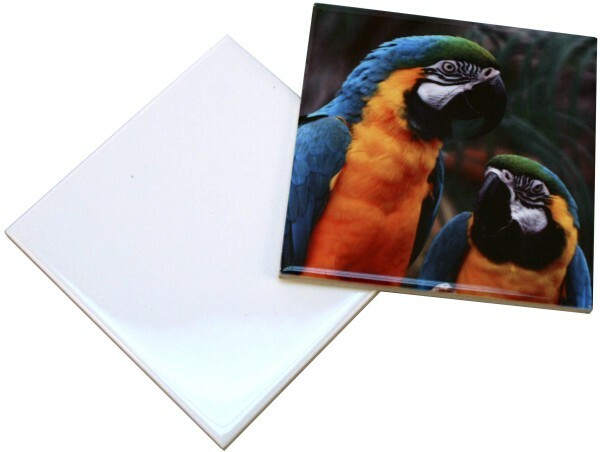 Blank tiles for sublimation are relatively inexpensive and it is usually fairly simple to sublimate these tiles. If you’re new to the process of sublimating ceramic tiles, here are a few tips and instructions that may be of help. Tip 1: The tiles must be poly coated. Sublimation only works on polyester or polyester coated substrates. Most places that sell sublimation blanks will sell tiles. Just be sure that whatever tiles you buy for sublimation are going to be usable for that purpose. If they aren’t poly coated, they will not work. Tip 2: Get a good heat press. If possible, you should avoid using a clamshell press to do tiles. Since the tiles are fairly thick and a clamshell is hinged at the back, you’ll wind up with uneven pressure and light areas on the tile if you try to use a clamshell press. Tip 3: Get a pyrometer and surface probe – To make sure your press is really 400 degrees when it displays 400, get a pyrometer and surface probe and check the temperature of the press in a few different spots. All too often the displays are inaccurate from a few degrees off to as many as 50 or more. Uneven temperature can effect the quality of your final product. Now, as far as a technique, our favorite method is to make sure that there is a good, fairly medium density to soft silicone rubber heat resistant pad on the lower platen on the press – then put the paper on that with the printed side UP, then place the tile face-DOWN on the print. Press with good medium-heavy pressure, enough to push the tile down into the pad on the lower platen. Press it for around 8 – 9 minutes @ 400 degrees. Doing it this way takes longer in the press, but by doing it upside down like that, you get a good sublimated image all over the face of the tile and even the beveled edge where the top/face slopes down to the side – a full bleed, edge-to-edge print of high quality. Depending on the sizes of the tiles and your press, you may be able to do more than one tile at a time. Just make sure you have even pressure all across them, and enough pressure to push the tiles down into the pad a little. Once the time is up, remove the tiles from the paper and the press (gloves are recommended for this process) and allow them to cool for a few minutes. Do not allow the tiles to cool with the paper still on them, as that can cause ghosting. Once they’ve cooled your tile should be complete. ← Is Sublimation Right for You?